Over the past few weeks, you may have already seen these Magnum ice cream bars pop up on feeds of various social media outlets. I remember when I first saw it, I thought to myself "So, what's the big dealio?". 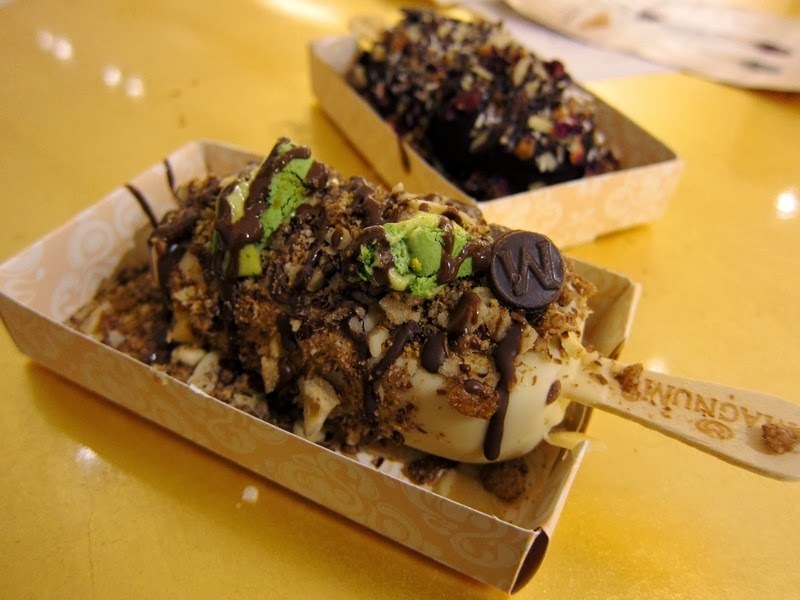 Well if you haven't heard, Magnum Ice Cream (@magnum_canada) has recently opened a pop up store in the heart of yorkville offering a customizable and indulgent experience with their premium Belgium ice cream bars. Despite the many customizable dessert shops that already exist (think Menchies, Marble Slab, etc), Magnum seems to assert itself as something special. I work around this area, and there is never a time where the line up doesn't span out the door and across several other store front entrances. Not surprising though, because this ice cream paradise is only here until August 30th. Are you lining up yet? The Magnum experience starts right when you enter. I take a second to marvel at store. Spacious, brightly lit, modern, and clean. A friendly staff greets you and hands you a simple menu. The long line up bare felt long as you have an struggle within yourself on how to personalise your frozen treat. With 2 ice cream flavours, 3 chocolate coatings, and 21 fixins, the combinations are endless. And the best part? Any combination is a fixed price of $6. The indulgent experience doesn't end there. When you are ready to dig into your creation, a section of plush sofas and gold trim furniture awaits you. I mean, at $6 for a small ice cream bar, I better be enjoying it on a gold studded throne! And now for the MUCH ANTICIPATED MOMENT. Getting that coveted creation in my belly! Conclusion? While I recognize this limited-time-only ice cream store is extremely gimmicky, I'll admit that I couldn't help falling in love with the experience. It was like re-living a childhood experience of being a kid in an ice cream store, except at a much more sophisticated and swanky caliber. If only this Magnum store was here to stay!